Precision Analog System signal conditioning solution used in Concurrent SIGnal Workbench(tm) for testing and developing turbine engines and turbomachinery equipment. Precision Analog Systems developed a signal conditioning amplifier and controller card for Concurrent Computer Corporation, for use in their SIGnal Workbench product line. 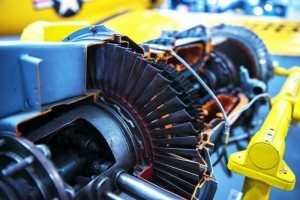 This equipment is used to test and develop turbine engines and turbomachinery equipment. Concurrent is a leading supplier of real time data acquisition and control systems and this equipment is available for purchase through them. Precision Analog Systems provided the signal conditioning expertise and designed the amplifier and control cards. Concurrent supplies the chassis, power supply, analog to digital converter card, cabling and their real time operating system. When a complete turn-key system is required for acquiring and processing dynamic signals, Concurrent offers a best in class software solution from Apex Turbine Testing Technologies. Four channel signal conditioning amplifier cards plug into the Signal Workbench chassis and provide up to 64 channels of signal conditioning in a 4U rack. Each channel provides an instrumentation amplifier with programmable gain from 1 to 4096, in 13 binary steps. A precise voltage calibration bus is provided in the backplane and can be routed into each individual input channel. This allows for offset and gain correction coefficients to be calculated for each channel and each gain. These coefficients can be applied to the output data to remove any offset and gain errors. Each output channel also provides a programmable voltage source and a programmable current source. The voltage source is generally used to drive bridge networks. The card is compatible with ¼, ½, and full bridge configurations. Bridge imbalance resistors, including an off board resistor, can also be selected with switches on each channel. The current source can be used to drive dynamic strain transducers. In this case, the current would be programmed to a DC value and the transducers impedance would be modulated to provide a signal that is AC coupled into the amplifier. The control card resides in the first slot of the SIGnal Workbench chassis, and it is used to configure the four channel amplifier cards. Configuration information from the host computer is sent to the control card through an internet connection. The RISC computer chip on the control card converts these instructions into a format that is compatible with the amplifier card’s register set and transmits it over the backplane bus. Calibration bus voltages are also generated by circuitry residing on the control card. These circuits include; a high accuracy 16 bit digital to analog converter, a precision resistor voltage divider, and analog switches that are used to select the source of the calibration signal. The calibration bus can be used to test the functionality and accuracy of the amplifier cards, before running a test. It can also be used to develop correction values that can be used to improve system accuracy. 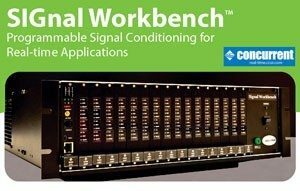 For more information on the Concurrent SIGnal Workbench, visit their website.